In Allegro, before making a symbol, you must create pins of PCB components first. Component package are divided into two types: SMD and line. Different packages require different pads. c.Anti pads with round, square, oval, rectangle, octagon, and arbitrary shapes, used to prevent pins from connecting to other networks. Usually 20mil larger than the regular pad size, if regular pad size is less than 40mil, you need to appropriately reduce the size difference. Solder mask is the part of the board that is going to be greenish. In fact, the solder mask is used negative output, to increase the thickness of the copper, usually using a solder mask to mark the green ink, and then add tin to increase the effect of copper thickness. Usually 4mil larger than the regular pad. It is used during the SMD process. Usually solder mask can not be larger than the actual size of the pad. It is usually the same size as a regular pad. It is used to add user-defined information. 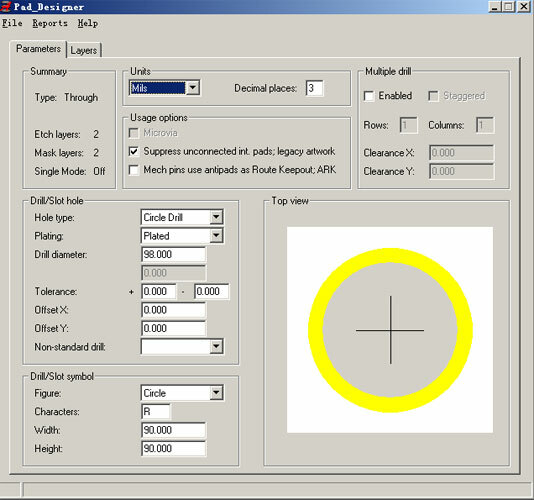 It is less used, thus, users can set their own size. Outer hole size: drilling size + 30mil.